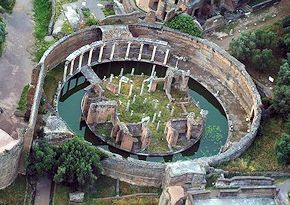 Hadrian here beguiled the time in the recollections of his Odysseus-like travels, for this villa built according to his own designs, was the copy and the reflection of the most beautiful things which he had admired in the world. The names of buildings in Athens were given to special parts of the villa. The Lyceum, the Academy, the Prytanetim, the Poecile, even the vale of Tempe with the Peneus flowing through it, and indeed Elysium and Tartarus were all there. Was Hadrian ever at Stonehenge? Ferdinand Gregorovius (Mary E. Robinson, trans. ),The Emperor Hadrian, A Picture of the Greco-Roman World in his Time (London: Macmillan and Co., 1898).